Do you love using your time-tested marketing and communications skills to inspire behavior change? Is piloting new approaches to promoting eco-friendly practices your forte? If so, we invite you to take advantage of an opportunity to use your skills to build a better future for San Francisco. 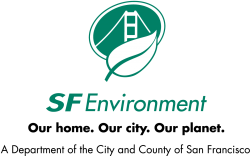 The San Francisco Department of the Environment (SF Environment) provides solutions that advance climate protection and enhance quality of life for all San Franciscans. SF Environment is recognized worldwide for its environmental policies and programs, which center on achieving zero waste, reducing environmental toxins, advancing environmental justice, promoting sustainable transportation modes, expanding clean energy infrastructure, greening our built environment, and protecting our urban forest. We're a passionate, mission-driven team and a great place to work, offering an attractive benefits package that includes healthcare and retirement. The Senior Marketing & Community Engagement Strategist is a skillful manager of projects and people who leads high-impact marketing campaigns, behavior-change initiatives, and communications in collaboration with City and community partners. Project goals will have a special emphasis on motivating people to get out of single-occupancy vehicles and into more sustainable transportation modes, though you'll nimbly shift to other focal areas, from supporting climate and clean energy projects to managing public-facing campaigns in support of zero waste. Serving in a supervisor-level position (Class 5642), you'll work under the guidance of the Class 5644 Program Manager (Communications & Community Engagement) and have day-to-day decision-making responsibilities for projects, as well as the ability to negotiate within project scopes. According to Civil Service Commission Rule 109, the duties specified below are representative of the range of duties assigned to this class and are not intended to be an inclusive list. Supervises staff and contractors, including Class 5638 (Environmental Assistant) and 9922 (Trainee) direct reports. This position is a Permanent-Exempt Appointment, with an anticipated duration of 36 months. The position is excluded by the Charter from the competitive civil service examination process and shall serve at the discretion of the appointing officer. Four (4) years of experience performing duties similar to those described in this class, within the specialty area of marketing & community engagement. The stated desirable qualifications may be used to identify job finalists at the end of the selection process when candidates are referred for hiring. Applicants must meet the minimum qualification requirement by the final filing date, unless otherwise noted. Candidates are requested to submit a resume & cover letter and attach it to their application. Upload this document as a PDF or Word file, with the naming convention of "YourName-5642MarketingStrategist". 3. Select either "I am a New User" if you have not previously registered, or "I have Registered Previously"
5. Attach a single document that includes a resume and brief cover letter (under 500 words) stating why this position interests you and how your skills and qualifications relate to the position. Upload this document as a single PDF or Word file, with the naming convention of "YourName-5642MarketingStrategist" Computers are available for the public (from 8:00 a.m. to 5:00 p.m. Monday through Friday) to file online applications in the lobby of the Dept. of Human Resources at 1 South Van Ness Avenue, 4th Floor, San Francisco. Applicants will receive a confirmation email that their online application was received in response to every announcement for which they file. Applicants should retain this confirmation email for their records. Failure to receive this email means that the online application was not submitted or received. Please email Preston Treichel, Senior Human Resources Consultant, at Preston.Treichel@sfgov.org should you have questions about the application process. For questions regarding the status of your application or the selection process, please refer to the 'Timeline' section under the Selection Procedures heading. Online application filing deadline will conclude at 8am on Monday, May 6th, 2019. Due to the volume of inquiries we receive, we are unable to give application status updates. While we are not able to reach out to every applicant, the hiring manager will contact you directly after the filing deadline if your skills and experiences are a strong match for the position. The selection process will include an evaluation of applications and an assessment of candidates' relative job-related knowledge, skills and abilities. Only those applicants most closely meeting the needs of the Department will be invited to participate in the interview selection process. Applicants meeting the minimum qualifications are not guaranteed advancement to the interview. • Candidates applying for positions with the Unified School District and the Community College District may be disqualified from consideration should their conviction history not meet the standards established under the California Education Code. • Candidates applying for positions with the Recreation and Park Department may be disqualified from consideration should their conviction history not meet the standards established under California Public Resources Code 5164. Having a conviction history does not automatically preclude you from a job with the City. All City & County of San Francisco employees are designated Disaster Service Workers through state and local law (California Government Code Section 3100-3109). Employment with the City requires the affirmation of a loyalty oath to this effect. Employees are required to complete all Disaster Service Worker-related training as assigned, and to return to work as ordered in the event of an emergency. 1. Your application must include details on all experience, education, training and other information that qualifies you for this recruitment. Failure to submit a complete and accurate application at the time of filing may result in your ineligibility for this recruitment or inability to receive full credit for scoring purposes. Any new information concerning work experience, education, training and other information that is submitted after the filing deadline may not be used to determine whether you meet the minimum qualifications. 2. Verification: Applicants may be required to submit verification of qualifying education and experience at any point during the recruitment and selection process. If education verification is required, information on how to verify education requirements, including verifying foreign education credits or degree equivalency, can be found at http://sfdhr.org/index.aspx?page=456. Falsifying one's education, training, or work experience or attempted deception on the application may result in disqualification for this and future job opportunities with the City and County of San Francisco. 4. Applicants are advised to keep copies of all documents submitted. Submitted documents become a permanent part of the exam record and will not be returned. The hiring department may require applicants to present additional material at the time of appointment and/or at a later date. 7. Terms of Announcement: Applicants must be guided solely by the provisions of this announcement, including requirements, time periods and other particulars, except when superseded by federal, state or local laws, rules or regulations. Clerical errors may be corrected by the posting the correction on the Department of Human Resources website at www.jobaps.com/sf. The San Francisco Department of the Environment, a department of the City and County of San Francisco, is a leader in climate, sustainable transportation, zero waste, toxics reduction and energy policy. Our mission is to provide solutions that advance climate protection and enhance quality of life for all San Franciscans. We’re looking for passionate people to help us make San Francisco a vibrant, inclusive and sustainable place to live and work. Our Department prioritizes the following values: credibility, innovation, collaboration, equity and impact. We pride ourselves in being a trusted source of environmental information. Working with a range of partners is essential to our success, as all our initiatives are underpinned by a commitment to equity, inclusiveness and accessibility.